A booster car seat is a must have for children who are still in that in between stage of riding in a car seat and being buckled in solo. Once I realized my son was getting a bit taller and his seat and straps were becoming a bit snug, I knew it was time to start shopping around for a booster seat. But, as a new mom, I had no idea where to begin! If you’re in search for the best booster car seat, read on to learn everything there is to know about choosing the right one! A booster car seat is a seat that is used when your child outgrows their forward facing car seat. It literally boosts them up and allows them to continue to sit front facing, but with the support of the car’s seat belt strap, and not a car seat harness. Yes, by law, all children under the age of four must be properly secured in a child restraint system, in the back seat (when possible). Violation of this law is a standard offense! Your little one is ready for a booster car seat when they are at least 4 years old and weigh 40 pounds or more. However, this varies by state and by the type of booster seat you purchase. If your child has grown too tall for their car seat, you’ll notice quickly. You’ll know this because their shoulders are higher than the top of the harness strap slots located on the back of the car seat. By law, they still need to be in some kind of boosted seat after they are finished with their front facing car seat. There are a couple different types of booster car seats to consider. They include high back styles and backless boosters. High back booster seats have just that—a high back. They look pretty much like a front facing car seat, except they prop a child into more of an upright position. These seats have lots of head and neck support. While they are generally buckled with a seatbelt, some models will boast a harness. High back boosters also tend to be convertible, meaning your younger child can sit in one with ease, and the high back can be removed for older children who are in school. These seats support kids from 30 pounds all the way up to 100 pounds. A backless booster is your traditional, standard booster car seat. It’s literally a little, padded seat that props your kids up and gets used in conjunction with only the seat belt in your car. It raises your little one to the proper height in your car so that they are positioned properly when buckled in. These are utilized at around 40 pounds and up to 100 pounds. When it comes to choosing an awesome booster, here are some helpful features to keep in mind! Convertible option. Choose a booster that starts with a high back and that can turn into a backless style. This way, you get two products for one price. Cup holders. Find a booster that boasts double cup holders. This way your kiddo can keep a water in one, and a snack or trinket to play with in the other. Frustration-free packaging. You don’t want to have to deal with putting straps and other components together. When possible, find something that gets delivered in frustration free packaging, if ordering online. Machine-washable pads. Even at this stage in the game, accidents can happen. So, be sure that your booster boasts washable pads so you can keep your seat clean and stain-free. Seatbelt adjuster. To ensure your child gets the best position, some boosters offer a seat belt adjuster. It attaches onto your car’s seat belt and properly postures your child when they are on the younger side and need a bit of support until the regular seat belt suffices. When shopping for a booster car seat, consider some important shopping tips. I personally prefer to shop online for my baby products. Not only do I get to do this from the comfort of my own home, but I feel like I get the best price and can read lots of reviews from other parents who have actually utilized the products. You know they are giving honest feedback and you can also post questions that they can answer too. You can also save up your registry reward dollars (if applicable) to make purchases on items that are needed later in your baby’s life, like this one. I personally put a booster on my registry so I wouldn’t have to worry about buying one later. But, many moms like to save up their reward cash and spend it later on when they need a big item, like a booster. If you’re not buying a booster online, be sure to read up on reviews and safety reports prior to making a purchase. Don’t be afraid to ask a sales associate if they can take one out of the box for you to view if the store doesn’t have any set up to browse. However, most major retailers will have them already out and set up. Different states have different requirements when it comes to using a booster seat. Not only do you have to consider height and weight guidelines, but also age. This map of the United States shows the age through which each state’s child passenger restraint law covering car seat or booster seat use applies, whether age five, ages 6-7, or age 8. When it comes to height and weight requirements, booster seats have the specifications outlined in their user manual. Some are ready to accommodate a child as little as 30 pounds. And, they can generally protect a child up to 110 pounds. Height varies depending on the model you select. The most important thing to consider is that your child is mature enough to sit up properly, have the seat belt properly positioned across their chest, and the peace of mind knowing that your child will not fiddle with their seat belt, unhooking it as you drive. Overall, children who are about four can really handle this responsibility. Installation of a booster seat is easy. The general rule of thumb is to keep your child behind the passenger seat, just as you did when they were in their baby car seat. If this isn’t possible for any reason, they can sit behind the driver. And, if you have multiple passengers (or additional car seats in your car), then seating them in the middle is fine too. To use the booster, you simply place it where you want it and seat your child in it. Then, you use the seat belt to go across your child’s chest and buckle it in place. The belt should sit firmly across their shoulders and the lap belt should not be around their belly. It should sit firmly across their lap (hence the name). You would do the same thing when you go to a backless style. Some backless styles utilize the latch method. This helps the seat not scoot around when it’s not in use. In fact, it’s always recommended that you belt in the seat when you drive without your child so the seat doesn’t pose as a safety threat if you need to slam on your breaks, or if you get in an accident. 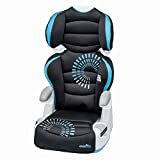 The Graco Nautilus (click here to check the price on Amazon) is a combination booster seat that's designed to grow with your child. A few adjustments allow you to convert the Nautilus from a harnessed booster to a high-back booster to a backless booster in minutes. Parents searching for a reasonably priced booster that will provide years of safety should definitely consider the Nautilus. Fully adjustable. Convert the seat to one of three settings to safely accommodate children from 22 to 100 pounds. Extensively safety tested. Meets or exceeds all U.S. safety standards for child safety seats, and has been side-impact tested for increased protection. Reinforced steel. Frame utilizes reinforced steel for even more safety and better distribution of energy in event of an accident. Adjustable headrest. Easily adjust headrest with just one hand to provide even more comfort for your child and accommodate growth. Extra features. Storage compartment and cup holders give your child a place to keep their snacks, drinks, toys, and other treasures in the car. Tight crotch area. The crotch strap is tight or uncomfortable for some children. Difficult to adjust shoulder straps. While using as a harnessed booster seat, the shoulder straps are slightly difficult to adjust. They do not operate smoothly once the child is strapped in, so you must find the right fit beforehand. Durability issues. As a budget model booster car seat, slightly lower quality materials are used on the construction. Though safety isn’t compromised, wear and tear will occur more quickly. The Evenflo Big Kid AMP (click here to check the price on Amazon) transitions from a high-back to backless model as your child grows. It is adjustable to 6 different height positions to suit children of all ages and sizes. The Big Kid AMP is a good choice for parents that want safety, style, and comfort without a high price tag. 2-in-1 design. A removable back allows you to easily convert this one from a high-back model to a backless model as your child ages and grows. Quality belt positioning system. The Big Kid AMP utilizes a top-quality belt positioning system to ensure that your car’s built-in seat belts keep your child firmly and comfortably in place. Foam liner. Used throughout the booster seat’s design, the high-density foam liner helps absorb more energy in an accident. Plus, it’s very comfortable. Machine washable. Kids are messy – we all know that. The outer cover of this booster seat is easy to remove and is machine washable. Lack of padding. There is a surprising lack of padding considering the quality of the foam used. It’s especially noticeable around the headrest and might be bad for napping children on long car trips. No belt to secure to seat. This model uses only your car’s seat belts to both strap your kid to the booster seat and strap the booster seat to the car seat. Many other models have an extra strap that helps more firmly attach the booster seat to the car seat. The Graco Affix High-Back (click here to check the price on Amazon) is designed specifically with bigger children in mind. It suits kids from 30 to 100 pounds and comes with a unique front-latch system. Graco’s attention to detail shines through in every inch of this booster car seat, making it perfect for parents that want good quality at an affordable price. 2-in-1 design. Most parents use this seat with the high-back in place but it’s easily removable to convert it to a backless model as your child grows. Intuitive latch system. The latch system teaches children independent buckling and provides another layer of protection in an accident. (Your car’s built-in seatbelt’s lap and shoulder belt are both used in addition to the latch belt). Extensively safety tested. The Affix exceeds all U.S. safety requirements. Its specifically been tested to protect from side impacts. Comfortable. Your child will love riding in this booster. High-density foam and an ergonomic design make it comfortable for long car rides. Only works with certain cars. The Affix isn’t compatible with every vehicle. Be sure to take a look at its exact specifications before ordering. Limited padding on seat bottom. Though it’s very comfortable on short trips, it may be uncomfortable on longer trips (multiple hours). The padding on the seat bottom is quite thin. Latch system not for everyone. A lot of people rave about the latch system while others don’t care for it. It’s important to consider whether you and your child want this unique feature. 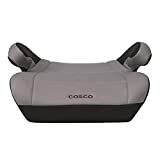 The Evenflo Maestro (click here to check the price on Amazon) is a combination seat that delivers the utmost in accident protection to children between 22 and 110 pounds, exceeding U.S. safety requirements by almost two times the regulations. The Maestro is a great choice for parents that want safe booster at a reasonable price. 3-in-1 adjustability. The Maestro can be used as a front-facing harness system, as a high-back belt positioning system, and as a backless belt-positioning system. Exceeds safety regulations. Designed to withstand more than two times the energy of the Federal Crash Standard, it's rated by the Insurance Institute of Highway Safety as one of the safest boosters on the market. Unique latch system. When used as a front-facing harness system, this seat employs four shoulder harnesses and two crotch harnesses to make finding the perfect fit easy. Lightweight design. You can easily the Maestro from vehicle to vehicle thanks to its lightweight design. Odd strap placement. Some children might find the strap placement uncomfortable when used with the built-in latch hardness system. Light but not super light. Thanks to its small size, many people select the Maestro for airport travel. Though it’s lightweight, it’s definitely not as lightweight as other models, making it somewhat of a hassle to lug through the airport. Cup holders add size. Another note on travel: when this booster has the included cup holders installed, it’s too bulky to go through the airport security scanner as a carry on. Remove them, or select a different model, if you plan to use your booster for air travel. Created with big kids in mind, Graco Backless TurboBooster (click here to check the price on Amazon) is for kids between 40 and 100 pounds, giving your child a boost so that your car’s built-in seatbelt system fits and is positioned correctly. Exceeds safety regulations. The TurboBooster is designed not only to meet U.S. safety regulations but to exceed them. Top-rated belt positioning system. The system used to keep your car’s built-in seat belts in place is the best around. It’s fully adjustable for an even better fit. Kids love it. The TurboBooster is stylish for a booster seat, with a backless design that tends to make kids feel less like babies and more like grownups. Single setting. Since this booster comes without a back, it can only be used in this backless setting, making only compatible with older children. Uncomfortable on long trips. Because of its backless design, the TurboBooster is often uncomfortable during extended use. The Graco Affix Backless (click here to check the price on Amazon) is the backless equivalent of the Graco Affix High-Back reviewed above, basically the same except it has no back. That means it comes with the same attention to detail and neat features at a fraction of the price. Large weight range. The Affix Backless suits a wide range of weights for a backless model. Children from 40 to 100 pounds can comfortably use it. Exceeds safety regulations. Graco went above and beyond while safety testing this booster seat, not only making sure it exceeds their own company ratings but U.S. safety requirements as well. Stylish. Kids love it because it doesn’t have a back. This tends to make it look more “grown up” than high-back models. Self-buckle. A self-buckle system makes it easy for kids to buckle themselves in (and for parents to check they are). Kids also love the independence this provides them. Might damage car seat. For some reason, the Affix Backless has uncovered, unprotected hard plastic pieces along the back of the seat that can potentially cause undue wear and tear to your car’s upholstery. Putting your child in a booster car seat is a big deal. Not only does it show you they are really growing up, but that their safety needs are changing while riding in a car. Be sure to choose a booster seat that boasts wonderful features and helps you maximize your investment. Also, remember to consult your booster’s user manual, in conjunction with state expectations when it comes to height, weight, and age of use.